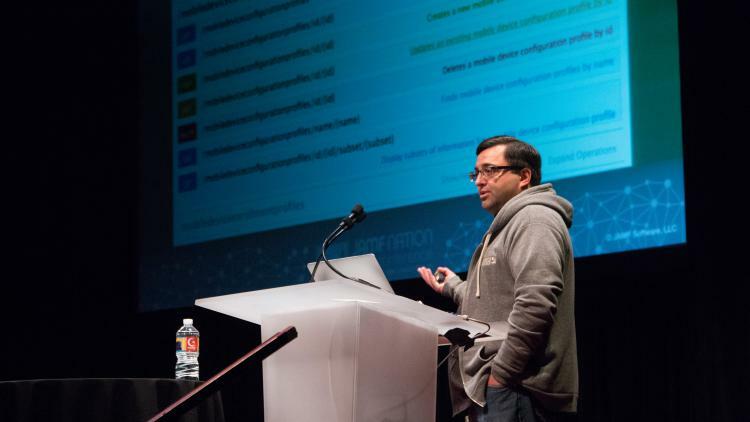 From the halls of National Geographic to the hallowed theatres of the Guthrie, Jehan Aziz explained how the storied magazine leverages the JSS API, web clips, smart groups, and unique workflows to access their database. The National Graphic team had recently consolidated their directories into a FileMaker database, when Jehan was asked to find a solution to distribute that new directory to their entire mobile workforce. Jehan knew he could use the Casper Suite to make the FileMaker app available, but the challenge arose when he needed to install the database file to make the app work. “FileMaker came to us with an 11 step manual process…by step 3 you are going to lose everyone, so we needed to find a better way,” Jehan explained. Calling on his 20 years of Mac experience, Jehan detailed how to sidestep this cumbersome, tedious installation steps by using the Casper Suite API. You can access available APIs by adding “/api” to the end of your JSS URL. Here you can see everything that you can read, write, and create via the API. Jehan suggested first setting up a workflow for your project, then set your variables, and finally write scripts to accomplish your task. National Geographic was able use APIs to trigger the install of the database file once users installed the FileMaker app. “We wanted to be as Apple as possible,” Jehan noted, which they were able to accomplish by having users now tap one button in Self Service to get the full company directory.